After two long and very expensive years the Mueller report is finished and early indications are it concludes with zero evidence of collusion between Russia and the Trump campaign. What few indictments were handed down earlier were procedural crimes and/or tax issues that had nothing to do with the 2016 Election, Donald Trump, his family, or his business. The anti-Trump liberal media has been throwing out claims of collusion, conspiracy, obstruction, and impeachment for months. None of it was true. Which of course means this same media and its D.C. Democrats cohorts have perpetrated a dangerously divisive hoax upon the American people of epic proportions. It’s why weeks ago Democrats in Congress shifted from the Mueller report to a rash of yet more numerous and expensive investigations launched against the president. They knew the Mueller report was about to be a dead so scrambled to generate yet more fake investigative headlines to distract enough Americans so as to avoid widespread (and rightful) condemnation for what they’ve done. Will they get away with it? MAXINE WATERS: There’s more to be learned about it. I believe there has been collusion. NANCY PELOSI: We saw cold, hard evidence of the Trump campaign, the Trump family eagerly intending to collude possibly with Russia. If you grew up in this country, it’s hard to shrug off charges like the ones you just heard. Maxine Waters is an irrelevant person, a living sideshow. But Nancy Pelosi is hardly that. She is the speaker of the House of Representatives. She’s third in line to the presidency. 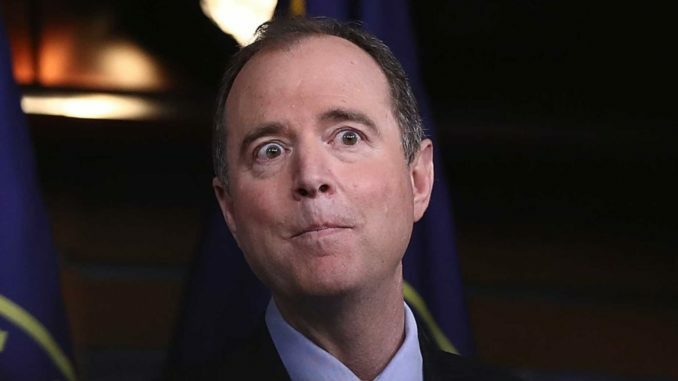 Adam Schiff is the chairman of the House Intelligence Committee. He’s privy to the most highly-classified information our government possesses. John Podesta was the Chief of Staff in one White House and a senior advisor in another. Beto O’Rourke has raised more money than anyone else running for president in 2020. These are not peripheral figures. They are the most serious people in the modern Democratic Party. We took them seriously. We felt we had a duty to understand why they were calling the president of the United States a traitor. There’s a lot more in the 11 minute clip, including breathless media coverage of false stories such as Cohen in Prague and commentators comparing Trump to Benedict Arnold, openly suggesting he should be hung. None of this was accidental or a mistake. From the moment Donald Trump took office, Democrats and the media have run with a narrative they desperately wanted to be true. They weren’t actually concerned about the country. Instead, it was simply an excuse to get Trump out of office because they didn’t like the outcome of the 2016 election. Now that the narrative is falling apart, there should be repercussions. Tucker goes on to make that point. There need to be consequences for this. Once the Mueller report appears and it becomes incontrovertible that, whatever his faults, Donald Trump did not collude with the Russians, the many people who’ve persistently claimed on the basis of no evidence that he did collude with the Russians must be punished. Not indicted or imprisoned, but thoroughly shamed and forced to apologize. If Republicans spent three full years falsely claiming that Barack Obama colluded with the government of Iran, would those who claimed it, ever work in politics or media again? That’s a rhetorical question. I’m not suggesting they should be forced off the air. But these people should have no credibility after this. Any media member, Democrat politician, or former CIA official that perpetuated this and refuses to admit their mistake should never be taken seriously again. There should also be a real investigation in to how much of what occurred was actually legal and who leaked classified information to feed this farce. 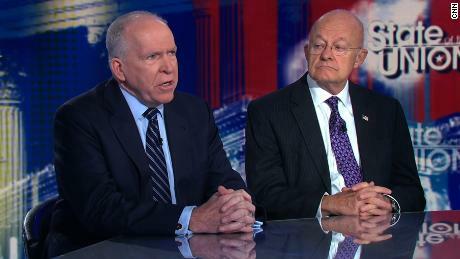 If John Brennan and Adam Schiff were leaking to CNN, as has been long suspected, they should be held accountable with the full force of the law. If Obama administration officials used a false pretense and improperly unmasked individuals to force a partisan investigation, there should be real consequences for that. If FBI and DOJ officials lied to a FISA court, that can’t just be brushed aside. None of this is asking to prosecute political enemies. It’s asking for our justice system to be evenly and fairly applied. This sad episode in our nation’s history has been profoundly damaging. It’s hamstrung foreign affairs, caused incredible division, and even led to violence as #resistance members lashed out in public, egged on by a narrative that never had factual backing. Fully 67% of Democrats believe Trump not only colluded with Russia but that Russia changed vote totals. That’s completely insane and it’s a direct result of people lying on a daily basis about things they had no evidence of. When the Mueller report finally drops, it’s going to be important to remember who pushed us so close to the edge and to point clearly to their political motivations to do so. REPORT: Why Do Democrats Want To Take American Back To The 1930’s? The 1930’s were a particularly tough time that saw the frightening rise of Hitler, Stalin, and Mussolini, the terrible difficulties of the Great Depression, and the subsequent deaths of tens of millions to war and the enslavement of hundreds of millions to authoritarian regimes. With that said, why in the world do Democrats today seem so determined to push America back to the 1930’s? From court-packing to Weimar Monetary Theory, their new ideas feel distinctly retro. For a party that prides itself on its appeal to the young, the Democrats sure have a lot of old ideas. Of course, no conservative would automatically gainsay an old idea, but the Democrats are supposed to be, you know, progressive. So let’s look at some of their oldies. First up: an idea straight out of 1937. In that year, President Franklin D. Roosevelt, fresh from a landslide re-election (he carried 46 of 48 states), which gifted him more-super-than-supermajorities in Congress, also resolved to build a supermajority on the Supreme Court. 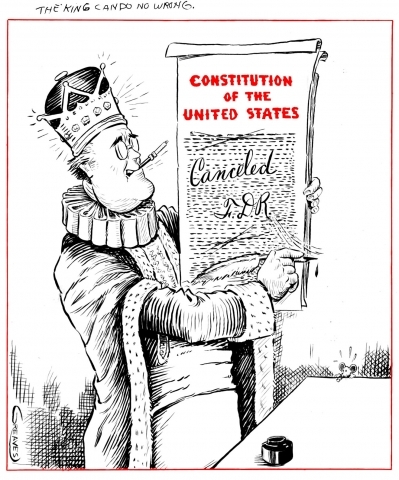 In previous years, the court, dominated by conservatives, had derailed many of Roosevelt’s New Deal programs. And so the re-elected 32nd president, feeling hubristic, sent to Congress a plan to expand the body from nine to 15 justices—with the idea being, of course, that he could appoint the new six. Republican opponents immediately dubbed the initiative “court-packing,” and the label stuck. Soon, conservative and moderate Democrats peeled away. And so, despite Roosevelt’s strenuous efforts—including an attempted purge of recalcitrant Dems—the court-packing plan died. Even worse from the White House’s point of view, the public, alarmed by visions of “Caesarism,” punished FDR’s party in the 1938 midterm elections, handing the GOP a massive victory. Indeed, the result was the formation of a bipartisan “conservative coalition” that dominated Capitol Hill for the next quarter century. In other words, the court-packing plan was the most consequential legislative and political failure of the Roosevelt administration. So perhaps it’s a bit strange that now, eight decades later, “court-packing” is making a comeback in Democratic circles. A March 18 headline in Politico lays it out: “2020 Dems warm to expanding Supreme Court.” As the article details, presidential hopefuls Pete Buttigieg, Kirsten Gillibrand, Kamala Harris, and Elizabeth Warren are all at least somewhat supportive of court-packing. In the meantime, the rest of us would do well to remember that if one side can pack the Supreme Court, the other side can, too. And so maybe both sides ought to agree to give the Constitution a respite from that sort of drama. Speaking of the 1930s, we can point to other ideas from that decade that are being dusted off. One is the New Deal—oops, I mean, the Green New Deal. As pitched by Congresswoman Alexandria Ocasio-Cortez and a swelling chorus of Democratic presidential wannabes, the Green New Deal seems to consist of one part concern over CO2 and another part desire to remake the rest of our society. Thus, in addition to the goal of defeating carbon, an early but revealing draft aims at providing free health care, eliminating racism, and guaranteeing “economic security to all who are unable or unwilling to work” [emphasis added]. If it’s impossible to find a conservative who thinks utopia is doable—or that the Green New Deal is utopia—it’s also hard to find a moderate who thinks such an earthly paradise is feasible. So maybe that’s one reason why Ocasio-Cortez’s national unfavorable rating is now substantially higher than her favorable rating. In the meantime, election-minded Democrats hope without much hope that AOC and her zealous allies will learn to chill. In the meantime, UBI has the support of many prominent lefties, such as former labor secretary Robert Reich. And yes, even some libertarians support UBI. In the meantime, the rest of us can say: if you like welfare dependency, you’ll really love UBI dependency. A third idea from the wayback machine is ultra-high income tax rates. Ocasio-Cortez has talked about pushing the top rate to 70 percent; she notes correctly that the top rate was that high or higher for much of the 20th century. Specifically, the top rate was raised from 25 percent to 63 percent in 1932, then to 79 percent in 1936, and then to 94 percent in 1944. Today, prominent economists on the left, including the New York Times’ Paul Krugman, agree that such high rates should be reimposed. We can say that the rich should pay more—here’s looking at you, carried-interest loophole!—and still be aware that raising rates is not the same thing as actually collecting revenues. That is, behavioral effects kick in, as earners and investors adjust their activity—and their accounting—to beat the rate. That’s the lesson of the Laffer Curve, which has guided Republican economics since the Reagan era. The issue is that money, especially at the high end, is so, well, liquid that it’s easy for fatcats to push their reported income down below whatever the desired threshold might be—or to channel it overseas. We can observe that for most of the 20th century, the specters of war, fascism, and communism had the effect of trapping American capital in the U.S.; that is, money just wasn’t safe in most places. And yet today, thanks, ironically enough, to U.S. victories in various hot and cold wars, easily 20 countries and jurisdictions around the world qualify as not just tax havens, but plausible places to hold citizenship, and perhaps even to inhabit. So while one can lament the ingratitude of tax exiles, what one can’t do—at least not without an extraordinary amount of effort—is collect money from them. To be sure, it’s possible to imagine an international regime in which enforcement and harmonization make tax exiling and other kinds of tax avoidance more difficult, even dangerous. But as we have learned, it’s hard to get the world to agree on much of anything. Moreover, there’s always the concern about killing the goose that lays the golden egg. So perhaps the better answer is to set reasonable rates and then seek to truly collect revenues from rich individuals and profitable companies that never seem to pay anything. For instance, earlier this year, we learned that Amazon made a profit of $11.2 billion in 2018, yet paid zero federal income tax. Does that seem fair to you? Not to me either. So again, before we go raising rates that chase economic activity out of the country, let’s reform the system such that billion-dollar people and trillion-dollar companies pay at least something. Moving right along, if we continue our look into the Democrats’ 20th-century memory book—if we delve back even further back, in fact, to the 1920s—we come upon an antecedent to Modern Monetary Theory. MMT, of course, is the voguish notion pushed by Stephanie Kelton, a longtime associate of Senator Bernie Sanders, which holds that countries with their own currency can print all the money they want without ill effect. Yet Modern Monetary Theory might just as well be called Weimar Monetary Theory, as we recall, without affection, the German hyperinflation of 1921-23. Historians regard that monetary debacle, which wiped out Germany’s middle class, as one of that country’s stepping stones on the road to Nazism. More recently, the Weimar-ish fate of Venezuela—another country with the freedom to print all the fiat currency it wishes—is also, shall we say, a discouraging indicator. It does seem that spending and deficits matter less than we were initially told. After all, in the wake of the 2008 meltdown, the Federal Reserve pumped $4 trillion into the economy, and inflation did not tick up. Why not? It appears that in slack times, as we saw during the last decade, the extra money just gets socked away—perhaps in Chinese mattresses. In other words, we could have spent a lot more on, say, productive infrastructure and not paid a price in higher prices. Yet even if we’ve been over-cautious, fiscally and monetarily, in recent years, the ultimate reality of inflation—that too much money chasing too few goods causes higher prices—is never going to change. So yes, for many hip Democrats, old ideas are new again. But that doesn’t make them good. What is going on with the Democrat Party? And how equally appalling to see the Establishment Media so unwilling to call out what is clearly blatant racism on the part of Democrats. Today Democrat House Whip James Clyburn, one of the most senior and powerful members of Congress, actually stated that the concerns of Holocaust survivors and their children was secondary to the opinions and experiences of Congresswoman Ilhan Omar and her repeatedly shocking anti-Semitic comments. This has to be one of the more bizarre efforts to protect somebody who has repeatedly peddled the worst anti-Semitic tropes, despite multiple interventions by people explaining exactly why her words were offensive. The implication is that because Omar fled Somalia she gets a free pass to target another religious minority. It also in itself is deeply offensive. Remembering the Holocaust, and the oft repeated phrase “Never Again,” is about making sure we’re proactive about combating anti-Semitism before it manifests in ways that lead to mass slaughter. The article above makes a valid and chilling point. This rush to excuse Congresswoman Omar’s anti-Semitism is the very same type of justification for the treatment of Jews during Nazi Germany. The German people had experienced hardship during and after WWI and the Jews became an easy target of blame. Now, within the United States Congress, something very similar is happening. This is so wrong on so many levels and yet most within the media and the Democrat party continue to grant cover for Congresswoman Omar’s racism. The word ‘troubling’ doesn’t do this situation justice. Let’s hope Democrats realize the dangerous path they have been taking on this, turn around, and work to make it right starting with a unified condemnation of the congresswoman’s words. Democrats opposed to any and all common sense border security clearly wanted chaos on America’s southern border. Illegal immigration this year is on pace to more than triple the levels of just two years ago, new projections reveal. In the month of February, there were more than 76,000 illegal border crossings and inadmissible foreign nationals, the most in this month in 12 years — a record for President Trump’s administration. 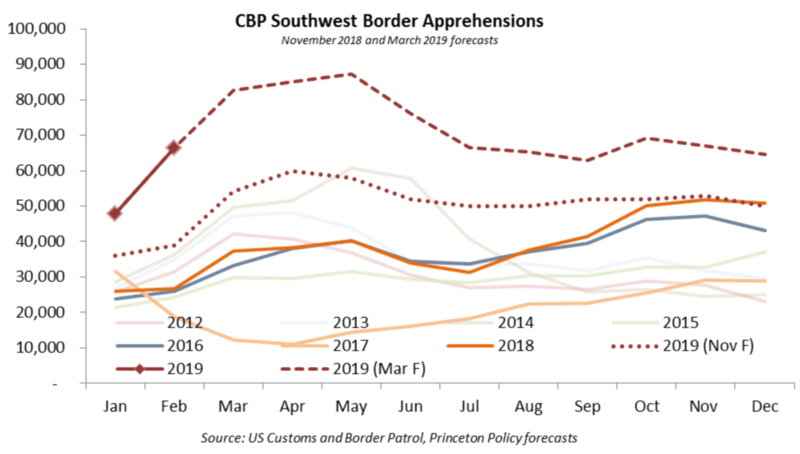 Princeton Policy Advisor Steven Kopits now projects that illegal border crossings for this calendar year will be more than three times what they were in 2017 and nearly double last year’s total crossings. The projection predicts there will be more than 840,000 illegal border crossings this year, though Department of Homeland Security (DHS) Secretary Kirstjen Nielsen predicts about 900,000 crossings. Should illegal immigration reach this level, as Kopits projects, it would mean that border crossings in Trump’s third year in office outpace every single year of illegal immigration under former President Obama. While Nielsen receives praise from her close allies in the Washington, D.C. beltway and political establishment, her tenure has been marked with overseeing the largest illegal immigration surge not seen since former President George W. Bush. That last point above is an important one that is purposely ignored by most in the media. The illegal immigration crisis has become a fixture of the Democrat Party playbook during Republican presidencies. The result is border chaos, including dangerous violence, but also more and more Democrat-controlled illegal votes come election time. Anyone who doubts this fact need only look at the voting habits of Texas by district and note how the largest pocket of pro-Democrat votes clearly comes from border communities where illegal immigration is at its worst. Coincidence? Hardly. Consider that without Texas no candidate who is not a Democrat would likely ever win a presidential election in America again. Now look at that map above. It clearly details what the Democrats are up to in fomenting the ongoing crisis at the southern border and also why they are so aggressive in their fight to keep President Trump from improving border security. Tens of thousands of illegals pouring into Texas every month which then turn into hundreds of thousands more Democrat votes come Election Day. It will be sooner, not later, that Texas tips blue for good and then it’s lights out for a safe, sovereign, and thriving, America. REPORT: America On Verge Of Another Civil War? It’s been a long time since America has been so divided politically, culturally, and spiritually. Two political commentators representing opposing sides found one thing they can both agree on—the country is coming very close to another civil war. 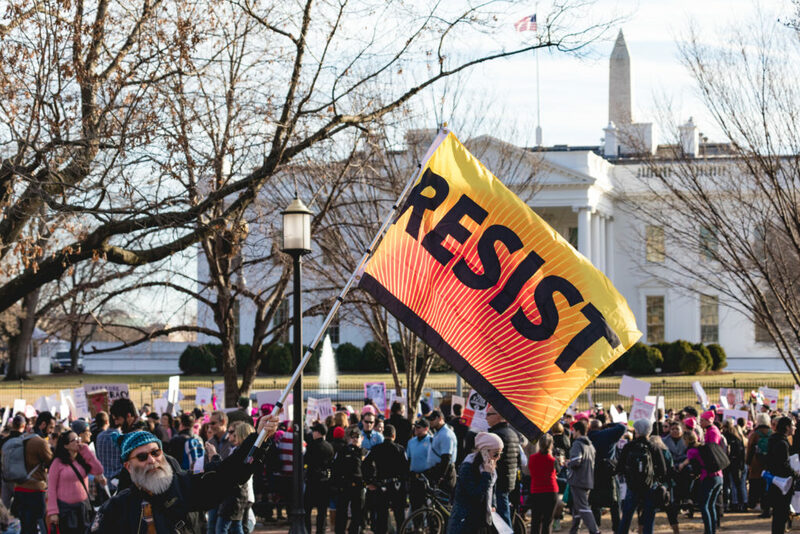 As improbable as that still seems to most, more and more are willing to concede things are getting increasingly intense as people watch and wait to see what Washington D.C. tries to do next. The next day, Nicolle Wallace, a former Republican operative turned MSNBC commentator and Trump critic, played a clip of diGenova’s commentary on her show and agreed with him – although she placed the blame squarely on the president. With the report by special counsel Robert Mueller reportedly nearly complete, impeachment talk in the air and the 2020 presidential election ramping up, fears that once existed only in fiction or the fevered dreams of conspiracy theorists have become a regular part of the political debate. These days, there’s talk of violence, mayhem and, increasingly, civil war. …The concerns about a civil war, though, extend beyond the pundit class to a sizable segment of the population. An October 2017 poll from the company that makes the game Cards Against Humanity found that 31 percent of Americans believed a civil war was “likely” in the next decade. More than 40 percent of Democrats described such a conflict as “likely,” compared with about 25 percent of Republicans. The company partnered with Survey Sampling International to conduct the nationally representative poll. Some historians have sounded a similar alarm. “How, when, and why has the United States now arrived at the brink of a veritable civil war?” Victor Davis Hanson, a historian with Stanford University’s Hoover Institution, asked last summer in an essay in National Review. Hanson prophesied that the United States “was nearing a point comparable to 1860,” about a year before the first shots were fired on Fort Sumter, South Carolina. President Trump wanted to do what neither the Republican or Democrat leadership wanted to do – help clarify the immigration status of millions of DACA recipients. Congress opposed the president, refused to make a deal, and now some Dreamers are realizing they were played by Democrats who apparently care nothing for them beyond using them as political pawns. DACA recipient Hilario Yanez invited The Daily Caller to shadow him as he walked around the U.S. Capitol in Washington D.C. to meet with elected officials. He wants more discussion on the future of those who have DACA status. Yanez, who is known for being a pro-Trump, pro-wall Dreamer, says he had a hard time setting up appointments with Democrats during the border budget negotiation process. But he was able to get a few Republican congressmen to hear him out, including Rep. Sean Duffy of Wisconsin, who allowed the Caller to sit in for the meeting. Democrats threw us under the bus and they’re using us as a 2020 issue and that’s very disappointing,” said Yanez. The federal budget deal didn’t include anything for those protected by the Deferred Action for Childhood Arrivals (DACA) program, despite Republicans signaling they would be willing to include protections for the “Dreamers” in exchange for the full amount needed for President Donald Trump’s planned border wall. Leading Democrats Now Hinting They Won’t Accept The Mueller Report If It Finds No Collusion. Yet another Banana Republic moment for the Democrat Party. As the Mueller investigation winds down and various leaks from that investigation suggesting it will fall far short of doing any kind of significant damage to President Trump, leading Democrats are now declaring they will likely ignore the Mueller conclusions and continue spending yet more taxpayer dollars to harass and attack the president. Shame on anyone who supports this version of the modern Democrat party. Many lifelong Democrats, upon hearing the accounts coming out of both New York and Virginia, thought it impossible. Surely the story was wrong. Surely it was some terrible version of fake news. Democrat officials aren’t actually advocating for terminating the life of a 9-month old child under the guise of protecting a “woman’s right to choose” are they? Then they learn that is EXACTLY what is going on right now in America. The once-great Democrat Party has veered off into the dark and dangerous wilderness of total radicalization where human life means little and common sense even less. …Last week New York Gov. Andrew Cuomo, himself a Catholic, ordered the spire above the One World Trade Center illuminated in pink to commemorate passage of the most permissive abortion law in America, which allows the procedure to be performed all the way up to birth. In response, Albany Bishop Edward Scharfenberger wrote to Cuomo that “your advocacy of extreme abortion legislation is completely contrary to the teachings of our pope and our Church.” Politically speaking, Cuomo’s position is also contrary to overwhelming public opinion, as only 13 percent of Americans, per Gallup, support legal third-trimester abortion, including only 18 percent of Democratic voters. But compared to the Democrats in Virginia, Cuomo actually seemed restrained. House Democrats there submitted an abortion bill that sponsor Kathy Tran admitted would permit pregnancy termination even once delivery of the baby begins. Gov. Ralph Northam — who is a physician — responded to the uproar by going even further, stating that “if a mother is in labor…the infant would be delivered. The infant would be kept comfortable. The infant would be resuscitated if that’s what the mother and family desired.” Apparently, the extremist governor of Virginia thinks that making a fully delivered newborn baby “comfortable” while his or her right to live is determined represents … compassion? The Democratic Party has traversed from acceptance of early-stage abortion as something that is “safe, legal, and rare” to a wholesale celebration of abortion throughout pregnancy, and even beyond. In addition, Democratic protestations about protecting the health of mothers fall flat because their inclusion of a mother’s mental and emotional well-being allows for nearly anyone to abort at any point during pregnancy. This absolutist position amounts to an infanticide stance that makes even Roe v Wade supporters understandably queasy. …President Trump, at last invited to deliver the State of the Union by Catholic House Speaker Nancy Pelosi, should use that august occasion to encourage adoption in the case of unwanted pregnancy and assail the anti-life and anti-Catholic extremism of the new Democratic Party. Most pro-choice voters recoil at the idea of full-term babies dying by lethal injection in the womb. In calling out Democrats, Trump can promote a culture of life and reap the electoral benefits of opposing the growing radicalism of the Party of Death. Democrat politicians are cheering laws which allow for the ending of a newly born human life even as millions of Democrat voters are first confused that such a thing could really be happening and then understandably outraged that it in fact is happening. What is next? A mass euthanization program for the elderly, the infirm, and all those deemed “unacceptable” to society? Something has gone horribly wrong with the Democrat Party. Something beyond mere politics. Call it out of touch, misguided, or even evil, it no longer represents working Americans, mothers, fathers, grandparents. What it does represent is something dark, something wicked, something far beyond any reasonable status quo. 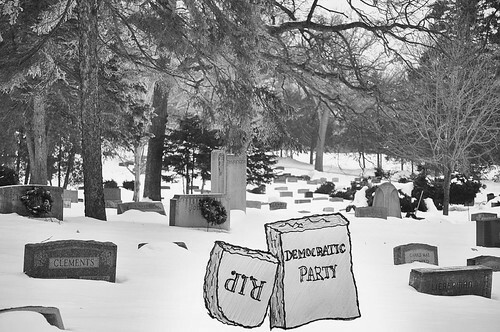 If you are currently a Democrat but also love life, family, children, it is now time to leave the party because in case you haven’t noticed the Democrat Party has, without a doubt, already left you. Pssst …Wanna See The Poll That Has The DNC Pulling Its Hair Extensions/Plugs Out? President Trump is as popular a presidential candidate AMONG DEMOCRATS as is Bernie Sanders and is within single digits of Kamala Harris and Joe Biden. It’s the poll result that has the DNC screaming WHAT THE HECK IS GOING ON HERE!!?? The answer is simple. Despite the ongoing 24/7 anti-Trump media, the Trump economy is doing well and President Trump has proven to be someone who does what he says and a whole lot of Democrats are quietly taking notice. It’s why the president’s approval among black and Hispanic voters is at an all time high for a Republican president. Remember all those polls in 2016 that had Hillary Clinton easily beating Donald Trump? Then we found out Trump’s true polling was a good 10 points higher than what the left-leaning national polls were reflecting. Those same flawed polls have Trump hovering at around 45% approval which means that once again his true approval rating is likely comfortably in the +50% margin and a big reason why is what’s reflected in the graphic below—President Trump and his many successes continue to make serious inroads with Democrat voters. It is yet another example that exposes the blatant media bias that continues to attempt to portray the Trump White House as divisive when in fact it is so often those opposed to the president who are themselves the most extremist and divisive. President Trump has appointed more women to high levels within his administration than any other president in American history. Black and Hispanic unemployment are at all time lows. Wages for women and minorities are up – big time. The true record of the Trump administration is among the most unifying of any in modern history – and certainly far better than that of his presidential predecessor, Barack Obama. 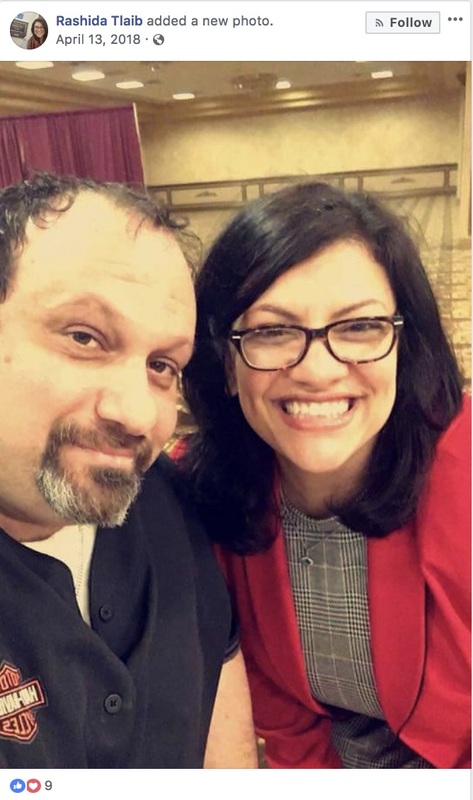 ABOVE: One of the new faces of the Democrat Party is reported anti-Semite, Rashida Tlaib. What the above information outlines is chilling proof of the degree of anti-Semitism that now permeates the Democrat Party. A more honest media would be calling this out but instead, repeated excuses are made for what is clearly an agenda of hate that sadly legitimizes the “shades of Hitler” charge some are now making against Democrats. The Democrat Party continues to embrace this agenda of hate. It owes the American people an explanation. 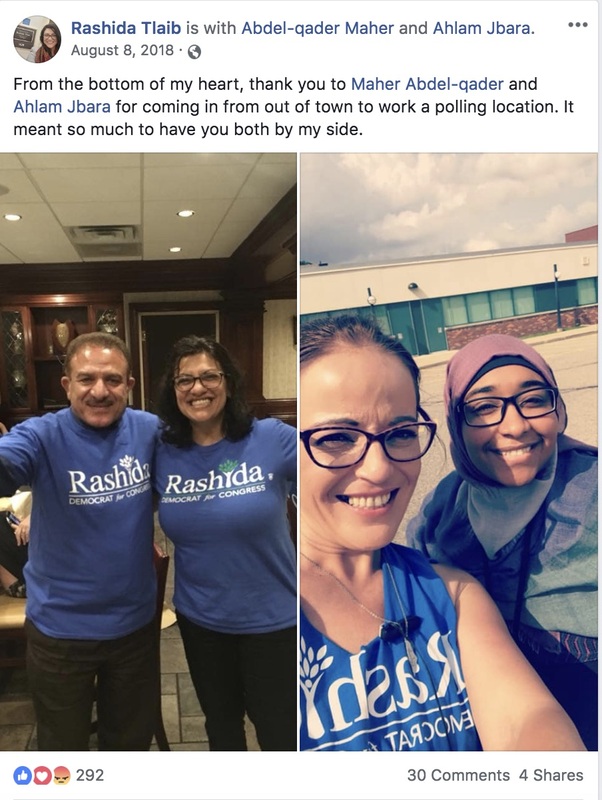 Better yet, it needs to disavow figures like Congresswoman Rashida Tlaib NOW not later. How is it that in 2006 and 2008 the vast majority of Democrat politicians were talking tough about the need for a wall on the southern border and kicking out of the country those who entered illegally? Hillary Clinton did it. So too did Barack Obama and Chuck Schumer. So, what changed? Answer: Sheer numbers. Currently in California 1 out of every 4 residents are foreign-born. The once Republican-leaning states like Colorado, Nevada, and New Mexico are now becoming Democrat strongholds. Democrats figured out that immigrants, particularly illegal immigrants from Mexico and Central America, are more than willing to help push elections into the Democrat win column. 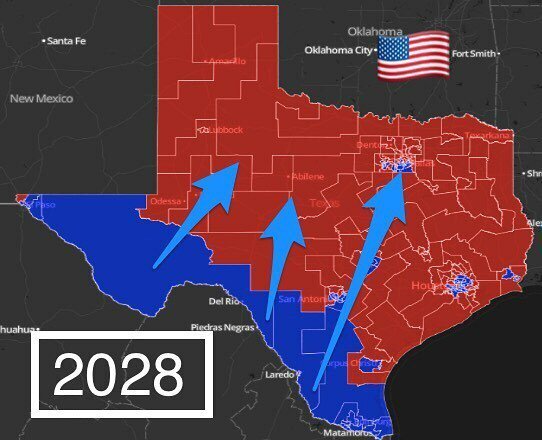 So much so in fact that now even Texas is considered to be in play for Democrats as soon as 2024. And if Republicans lose Texas they will never win another national election again. Once upon a time, Democrats such as Hillary and Bill Clinton and Barack Obama talked tough about illegal immigration. They even ruled out amnesty while talking up a new border wall. In those days, progressives saw illegal immigration as illiberal — or at least not as a winning proposition among union households and the working poor. Democratic constituencies opposed importing inexpensive foreign labor for corporate bosses. Welfare rights groups believed that massive illegal immigration would swamp social services and curtail government help to American poor of the barrios and the inner city. So, what happened? Again, numbers. Large numbers of unassimilated immigrants added up to politically advantageous demography for Democrats in the long run. A wall would probably reduce illegal immigration dramatically and with it future Democratic constituents. Legal, meritocratic, measured and diverse immigration in its place would probably end up being politically neutral. And without fresh waves of undocumented immigrants from south of the border, identity politics would wane. A wall also would radically change the optics of illegal immigration. 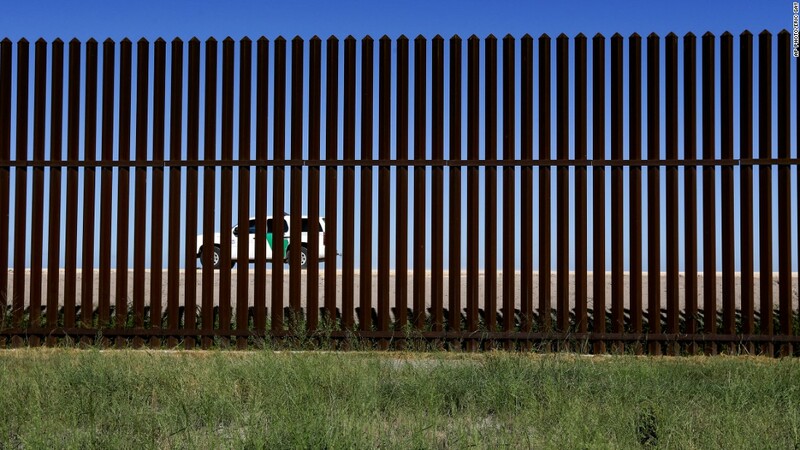 Border guards would be mostly invisible from the Mexican side of the wall. Barbed wire, dogs and tear gas astride the border — the ingredients for media sensationalism — would be unnecessary. Instead, footage of would-be border crossers trying to climb 30-foot walls would emphasize the degree to which some are callously breaking the law. Such imagery would remind the world that undocumented immigrants are not always noble victims but often selfish young adult males who have little regard for the millions of aspiring immigrants who wait patiently in line and follow the rules to enter the United State lawfully. More importantly, thousands of undocumented immigrants cross miles of dangerous, unguarded borderlands each year to walk for days in the desert. Often, they fall prey to dangers ranging from cartel gangs to dehydration. The wall would make illegal crossings almost impossible, saving lives. Latin American governments and Democratic operatives assume that lax border enforcement facilitates the outflow of billions of dollars in remittances sent south of the border and helps flip Republican states to Democratic ones. All prior efforts to ensure border security — sanctions against employers, threats to cut off foreign aid to Mexico and Central America, and talk of tamper-proof identity cards — have failed. Instead, amnesties, expanded entitlements and hundreds of sanctuary jurisdictions offer incentives for waves of undocumented immigrants. The reason a secure border wall has not been — and may not be — built is not apprehension that it would not work, but rather real fear that it would work only too well. If you’ve ever wondered why Democrats are fighting so hard to prevent $5-$6 billion being spent this year for President Trump’s border wall proposal within the context of a trillion+ dollar annual budget, you have your answer. Politics. Back in 2006 unions were strongly opposed to illegal immigration and so Democrat politicians beholden to union campaign contributions, demanded something be done about illegal immigration. That tune changed dramatically when political operatives realized the extent to which immigrants, including illegal immigrants, could be utilized to sway election outcomes. The power of these votes was greater even than union worker votes and far more reliable. Where union workers might shift from Democrat to Republican, as they did in such great numbers with Reagan and more recently President Trump, immigrant votes were much more consistently loyal due to those voters being so dependent upon Democrat-supported government programs. The Democrat sponsored open borders immigration policy is a multi-billion dollar get out the vote operation funded entirely by YOU, the (legal) American voter. Some believe there are now entire voting districts throughout the country where nearly every single Republican vote is cancelled out by an illegal immigrant vote. Democrats (and their media cohorts) strongly denounce any charge of widespread illegal immigrant voter fraud while behind the scenes they are enthusiastically supporting the very fraud they publicly claim doesn’t exist. The Democrat Party cares nothing for laws. It only cares for itself regardless of the cost to the United States and its laws. In fact, a growing number of Democrats now openly share their disdain for traditional America. They want that America destroyed and fully absorbed within the globalist movement that right now threatens the long-standing practice of sovereignty all across the world and would have a handful of elites regulating the lives of billions. That’s the real war going on right now all around us and illegal immigration is the front line. Yes, It’s True. Democrats Voted Today To NOT Pay Federal Workers During The Government Shutdown. Nancy Pelosi and other increasingly nervous Democrats in Congress have claimed that President Trump was “holding federal workers hostage” during the government shutdown. Today, Democrats were given the opportunity to make sure those same federal workers received paychecks as negotiations continue regarding border security funding and ending partial shutdown. THEY VOTED NO. This has been and very much remains Nancy Pelosi’s shutdown. Speaker Pelosi is scared to death of the radical left in her own party – the same radical left who has threatened her speakership should she relent to the president’s desire to sit down and negotiate a deal between the two sides. And don’t allow the Establishlment Media to tell you any different. They have been covering for Pelosi and those same radical Democrats, but the American people are starting to see through the ruse. Democrats care little about the Middle Class. They care far more about allowing illegals to enter the country. It’s time more and more voters start to ask themselves why that is. It’s a letter that is now going viral, penned by a (former) Democrat and two-time Obama voter who has seen and heard enough from the socialist/leftist/fascist mob that they feel has become the modern Democrat Party and Establishment Media in America today. It’s a poignant “Enough is Enough” moment that is likely shared by millions across America following the dangerous and heinous attacks against a group of Catholic students who did nothing wrong while waiting for a bus to take them home following a trip to Washington D.C.
Hello everyone. My name is … well my name isn’t important. What I’ve decided is. I admit it. I was a Democrat. I voted for Barack Obama. Twice. I hated Trump. And voted libertarian in 2016. But over the last year or so, as I’ve watched the nation completely lose its way and with it all sense of decorum, civility, and compromise, I’ve witnessed a president who refuses to give up on campaign promises. This is a man who will not be cowed and pushed. He will not give in when an issue is important. He truly is an outsider and will not succumb and be absorbed by the political establishment. His republican colleagues did all they could to hinder his election. They hated him and feared him. Now they fall in line like the good little spineless politicians they are. Trump doesn’t hate them because the opposite of love isn’t hate – it’s indifference. And that’s how Trump is to those who don’t matter (and there are a bunch of people who do not matter – no real unique and special snowflakes exist). These establishment types are simply soldiers to the president. And soldiers are nothing but a great leader’s tool. I may not agree with him always. But I don’t doubt him any more. Not after what I’ve seen. Not after what I’ve experienced. The other side doesn’t want equality. They want totality. I saw signs of this in the 90s but I fell in line like a good little Democrat. When they came for the family life, I didn’t say anything because I did not realize the severity of what would happen to the next generations. When they came for free speech, I didn’t say anything because I was too busy rolling my eyes at the notion of Barry being anything but a good guy who plays basketball and loves his kids. When they came for everyone’s backbone and replaced it with trigger warnings and safe spaces (phrases I shudder to know have now forever entered our lexicon) I didn’t say anything because I was fooled into believing these were isolated incidents and there was no way the silliness could spread so far, wide and deeply ingrained into the soul of so many. Do you see what they think of men with their #metoo and seething calls of “toxic masculinity” with their witch hunts and razor commercials? Do you see what they think of capitalism and their hatred for the hundreds of thousands who fought and died to make America the light of hope for millions around the world? Do you see what they they think of self-reliance and ingenuity as they serves as pimps and drug dealers to over half the population? Getting them hooked and dependent on the government and unable – unwilling – to care for themselves. Do you see what they think of the symbols that used to define us and unite us? They celebrate kneeling during our songs, burning our flag, and tearing down the reminders of our history – both for good and for ill – as did the Nazis before them and the Huns of old. Do you see how they make the people hate the very ideals of the nation that gave them the power to do all these things? Do you see how they divide the races and try to make us even more at odds with one another than we were during those sad days during the Civil Rights Movement despite all of the roadblocks that have been torn down? They tell the ones who are dependent on them that White people are all evil, that white men are satan. They make an strawman enemy to last a lifetime. And when they finally came for an innocent kid from Kentucky, one who was likely on the trip of a lifetime from his small town and now could have a lifetime of ridicule over “fake news”, I decided I was not going to stay silent any longer. I was going to say something. What they are doing to that young man is wrong. It’s depraved. The creators, purveyors, and perpetuators do not just deserve punishment in this life but also in the next. Too harsh? No. For they are so blinded by hate they cannot see what they have done to this nation. Truly we have become Rome. We are crumbling. We are dying. Can we rebuild? Can we overcome the forces of muck and grime and swamp that have slowly and quietly eaten away at our foundations? For decades these vile beings came quietly on the backs of calls of “change”. That change came alright but once the Pandora’s box was open all kinds of perversions spewed forth. The dam broke. The nation was flooded. Can we rebuild? Can we resow? I do not know. But I am silent no longer. Not when they came for that boy from Kentucky. And not when they come for anyone else going forward. Congratulations to the modern left. You lost another one. I imagine there will be many, many more 18 months from. Edited: thank you all so much for the kind words. I just needed to get my thoughts out there for myself. While I have gotten tons of support, I’ve also gotten a bunch of horrible personal messages. I just don’t understand the hate. It’s a massive shift in the makeup of the U.S. population courtesy of illegal immigration. And if anyone doesn’t think the Democrat Party isn’t aware of this you’re either foolish, blind, or both. 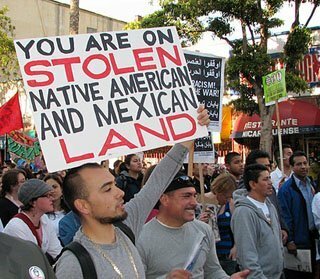 The entire electorate of the United States is being manipulated via promotion of coming to this country illegally. That’s not an immigration policy – it’s welcoming an invading force. And while many of those people are genuinely seeking better lives, they are doing so by breaking the law. And where they come, many-many of humanity’s worst are following, endangering neighborhoods, businesses, and law enforcement. 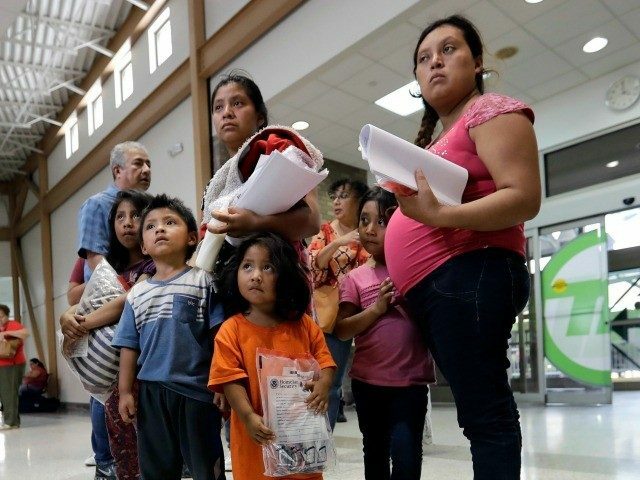 The U.S.-born children of illegal aliens are commonly known as “anchor babies,” as they anchor their illegal alien and noncitizen parents in the U.S. when they are granted immediate birthright citizenship. There are at least 4.5 million anchor babies in the country, a population that exceeds the total number of annual American births, as about 300,000 anchor babies are born every year, exceeding the total number of American births in 48 states. Currently, the U.S. and Canada are the only developed nations in the world that offer unrestricted birthright citizenship. Data compiled by the Migration Policy Institute finds there are at least 1.2 million anchor babies under the age of 18 residing in the state of California with their illegal alien parents. This is about twice the entire population of Wyoming, where about 570,000 residents live. The above scenario is how the state of Florida will soon be pushed permanently in voting for Democrats during a national election cycle and not too long after that, Texas will follow and a non-Democrat candidate will never win the presidency again. That’s the Democrat Party plan – one that was escalated during the Obama years and continues to be even more aggressively defended against a Trump administration that is trying to halt it. Democrats are giving up the self-determination of the country for votes, be they illegal or other. Is such an act treason? That’s for you to decide. 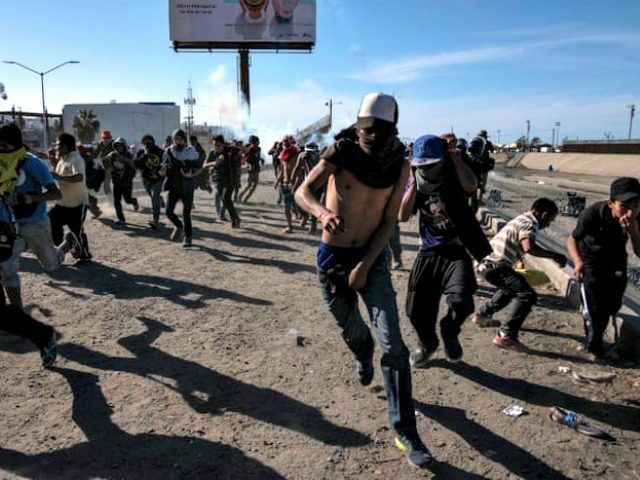 What is undeniable is that the Democrat Party and its Establishment Media cohorts are encouraging millions to enter the United States illegally, get on taxpayer-funded government assistance, and then vote in our elections. How frustrating it must be for those immigrants who came to this country legally, went through the process, and worked hard to have a chance at the American Dream only to see millions cut the proverbial line, bring crime and violence with them, which in turn too often snuffs out the light of that dream and leaves far less opportunity for the next generation of legal immigrants who would follow. And make no mistake, if the vast majority of these illegal immigrants were then voting Republican, Nancy Pelosi and Chuck Schumer would be front and center right now declaring a national emergency. We are either a nation of laws or we are not. It’s long past time for all of us to decide, including all those contributing to the stifling stench of political climate change within the halls of Congress. The partial government shutdown could end NOW if Democrats would practice just half the common sense on display here by Republican Congressman (and Navy SEAL war veteran) Dan Crenshaw. What President Trump is proposing is both common sense, and money well spent. What Democrats are doing is thinking they’ll get some more illegal votes come election time, the safety and security of American citizens be d*mned. The president is proposing less than $6 billion be spent on building new and sorely needed physical barriers along the southern border. Democrats wish to ignore the problem – one which is costing the U.S. taxpayer $100 billion or more PER YEAR. Most of you likely noticed the shrill cries of “Russia! Russia! Russia!” over the weekend as multiple socialist news media outlets were all clearly reading from the very same script. The gist of the coverage was that after President Trump fired FBI Director James Comey the FBI had “no choice” but to launch an investigation into a sitting president of the United States under the guise of potential Trump-Russia collusion. What really happened, though, is that these same media reports blew apart the entire fake Russia Gate narrative, proving beyond a doubt that the FBI’s move was overtly political and intended to punish America-First, President Trump for having defeated globalist, Hillary Clinton. Remember, the DOJ #2 at the time, Rod Rosenstein, went to President Trump and recommended Comey be fired. Also don’t forget that just months earlier nearly all leading Democrats and most within the socialist media were calling for the exact same thing. So, President Trump, on the recommendation of Mr. Rosenstein, fires James Comey. Rosenstein then immediately uses that firing to push for a Special Counsel investigation into the Trump campaign and Trump administration while at the very same time, the FBI launches its own investigation into the newly elected President of the United States. While this is going on, former Obama and Clinton officials are orchestrating a wave of leaks to their socialist media contacts, ensuring the fake Trump/Russia collusion narrative is quickly formed. This is all Deep State machinations of the worst kind and is no way reflective of a republic or a democracy but rather a dictatorship where the votes of millions are potentially wiped out by the globalist establishment hell bent on maintaining the status quo. To date, after nearly two years of looking, there has been no evidence of collusion between Russia and the Trump campaign. NONE. The socialist media opines about meetings, discussions, and comments by President Trump and those around him as speculative proof that “something” might have been going on. The Mueller investigation, after tens of millions of wasted dollars, has chased and intimidated Trump associates both close and far to try and build a case that was never there. Some now face jail time for matters unrelated to the Trump campaign and/or the Trump presidency such as years-ago tax issues or the big umbrella charge of “lying” to the FBI. If true justice is to be served, it will involve charges being filed against all those who helped perpetrate these ongoing investigative crimes against President Trump, his administration, and the tens of millions who voted for him and continue to support the work he’s doing—work that has resulted in record low unemployment, wage growth, a stronger military, America-first trade agreements, and potential peace across the globe. This kind of Deep State abuse of power can never be allowed to happen again. Dems Party With Lobbyists In Puerto Rico During Government Shutdown. Democrats don’t care about some federal workers not getting paid because of the partial government shutdown. Proof of that is the story out this weekend showing thirty Democrat members of Congress partying down in the sun and sand in Puerto Rico with more than 100 lobbyists. So when you hear a Democrat pretend to cry about the poor government workers who aren’t getting paid, remember the following pics and how they refuse to negotiated with President Trump to fund border security and re-open the government. The president is awaiting their return so a deal can be forged while Democrats would rather soak up the sun and get drunk and shmooze with lobbyists who are buying their votes. …The event is taking place in a seaside resort where rooms go for $429 a night. Food is being provided.